"Clooney-mania" reached a fever pitch Monday as star-struck women lined up in droves and the tiny town of Mayville, Ky., rolled out the red carpet -- literally -- for homegrown movie star George Clooney. The Oscar-winner was there with co-star Renee Zellweger for a special screening of their new movie, "Leatherheads," a romantic comedy about small-town professional football in the 1920s. It marked a homecoming of sorts for Clooney, who grew up in nearby Augusta, and was an unlikely place for a film premiere, some 2,000 miles from Hollywood, along the Ohio River in northern Kentucky. For years, his father, Nick Clooney, made the 45-mile commute to Cincinnati, where he was a television newscaster. Nick and Nick's sister, singer-actress Rosemary Clooney, grew up in Maysville, where their grandfather was mayor. To see photos of the Clooney/Zellweger promo tour for "Leatherheads"click here. It was in Maysville more than a half-century ago that Clooney's aunt insisted the premiere be held of one of her movies. "We've lived a huge part of our lives here," Clooney told an enraptured audience shortly before his movie was shown in a downtown opera house. "... This is a home for us, and we're very proud to be able to bring this back full circle." Maysville Mayor David Cartmell proclaimed it "Renee Zellweger Day" in town. As for Clooney, "Since Renee took this day, we thought we would proclaim every day in Maysville to be George Clooney day," the mayor said. Earlier Monday, Clooney and Zellweger stopped by Duluth, Minn. to thank residents for the role their city played in the football comedy. The stars began a whistle-stop tour to promote "Leatherheads" with an appearance at the Depot, an old train station in downtown Duluth. They arrived aboard a train, wearing period clothes reflecting the movie's 1920s setting. To see photos from George Clooney's life and career, click here. Clooney, who also directed "Leatherheads," said he understands Duluth is "cold in February, so we ended up trying to find someplace a little warmer." The movie was inspired by the old, rough-and-tumble Duluth Eskimos pro football team, but was filmed last year in North Carolina and South Carolina. "But the spirit of it all was about this," Clooney told a news conference packed with reporters and fans. "We wanted to represent the town." In "Leatherheads," which opens April 4, Clooney plays Dodge Connolly, an aging player on the Duluth Bulldogs in 1925, while Zellweger plays Lexie Littleton, a feisty Chicago newspaper reporter. John Krasinski (TV's "The Office") plays Carter "The Bullet" Rutherford, a World War I hero and former college football star who is lured to the Bulldogs and becomes the third side of a love triangle with Dodge and Lexie. Before "Leatherheads" was shown in Maysville, Clooney and Zellweger visited with people there who had braved the cold to get a glimpse of the stars. Women let out shrieks at seeing Clooney, and the stars signed autographs and posed for photographs. Sharon Conrad was among the bundled-up fans who stood for hours along a railing next to the red carpet. She was rewarded for her patience by getting an autograph from Clooney. Conrad, 52, drove 12-1/2 hours from her south Georgia home and had already spent about $100 in gas and was staying with a friend. "I just dropped everything I was doing and hopped in the car and came," Conrad said. Clooney's mother, Nina, said it's fun to watch the adulation her son receives from women. "They can flirt without it being dangerous," she said. "They love it, and I think that's great." Nick Clooney said it was his son's idea to have the special screening in Maysville, where his family has deep roots. "This little town has given the Clooney family a lot of gifts over the years, and here's another one," Nick Clooney said. "It's really wonderful to see this kind of response from all these wonderful people." Karen Rayburn Edwards drove about an hour-and-a-half from her northern Kentucky home and was among the early arrivals to stake out a prime spot near the red carpet. A few snowflakes were falling, and Edwards was wrapped in a blanket several hours before the scheduled premiere, but said it was worth the long wait. "Our blood runs hot for George," she said. "It's a once-in-a-lifetime chance." Edwards was holding a sign letting everyone know that Monday was her birthday. She hoped to have her picture taken with the actor, saying it would be a perfect birthday gift. As it turned out, she got a better treat - she gave Clooney a kiss. Megan Muse, a local bank teller, took vacation time to get a glimpse of Clooney. She said the attention was priceless for the town: "I've never seen Maysville so many times on the Internet, on TV." The Hollywood-style event also says plenty about Clooney, she said. "It shows he's a good guy," Muse said. "He doesn't let Hollywood get to him." Downtown businesses displayed "Leatherheads" posters in their front windows. Special lighting was set up outside the opera house to give a Hollywood feel when Clooney and Zellweger walked the red carpet. Nearly 275 people were expected to see the first showing. The audience included Clooney family and friends, as well as Gov. Steve Beshear and his wife, supporters of the renovated opera house, and a group of local high school students. It might have been the hottest ticket in Kentucky. "I had no idea how many relatives we had here," Nick Clooney joked. Demand for tickets was so overwhelming that Universal Pictures added a second screening later Monday night. A lottery was used to distribute the passes. Nick Clooney said he was looking forward to seeing the movie for the first time. "I wait to see it like everybody else does," he said. "I get my popcorn and rub elbows same way as everybody does." Nina Clooney sounded like a proud parent when talking about her son's progression as an actor and director. "I will see him do something, and I will think, `Wow, that's just the best,"' she said. "And then I turn around, and he will come up with something else that tops that and takes it to another level. I love watching that growth in him as a person." It's not the first time Maysville has hosted a special screening for a Clooney. In 1953, Rosemary Clooney came home for the premiere of her movie "The Stars are Singing," at a theater a couple of blocks from the opera house. 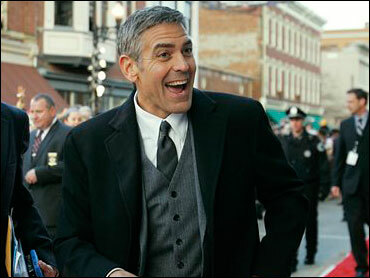 George Clooney's visit was part of a publicity surge for the town of about 9,000 about 60 miles southeast of Cincinnati. The local Mason County High School boys' basketball team won the state high school tournament on Saturday night. Former President Bill Clinton was scheduled to visit Maysville Tuesday as part of a Kentucky campaign swing for his wife, Democratic presidential hopeful U.S. Sen. Hillary Rodham Clinton. "We've hit the publicity trifecta," Cartmell said.